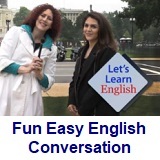 ﻿ Fun Easy English - new classroom free online classes english language lessons speaking listening writing reading february 24. 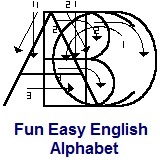 Today in the Fun Easy English classroom you are going to learn the correct way to write the English alphabet letter D in manuscript and cursive. Writing the English alphabet letter D correctly in manuscript and cursive. This letter is pretty is easy to write in both manuscript and cursive. In this lesson When Pete and Anna meet with Director Kelly, they arrive late. Both tell very different stories about their morning. A show begins. Anna: Today, Pete and I are meeting with a consultant who will help us with our new show. Yesterday, Pete had promised to meet me here at 8:00 am. but he did not come on time. Prof Bot: Uh-oh. It’s bad to be late for a business meeting. But while we wait for Pete, let’s talk about a new verb tense -- past perfect! You know the past tense, right? Like, "Pete promised to meet me here at 8:00 a.m." Past perfect is a little different. When we talk about two things in the past, we can use the past perfect for the first event. Put "had" before the past participle. "Pete had promised he would meet Anna." 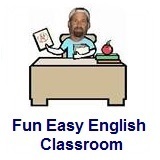 Here's your assignment: find sentences with the past perfect tense. Remember, look for "had!" Kelly: You two are late -- exactly 43 minutes late! What happened? Anna: He had to get his "special" coffee -- SPECIAL coffee! Pete: She had to feed her birds -- HER birds! Kelly: Okay, I can see already that you need my help. You can’t both talk at the same time. You have to take turns. Alright, Anna, you go first. Anna: Sure. Kelly, see, Pete and I live in the same building. So, we decided to meet at 8:00 a.m. - 8:00 a.m. to come to work together. I had waited 15 minutes when Pete arrived! Kelly: Hum. I didn’t get that message. Anna: "After Pete had wasted time waiting for coffee, we were late. Look at that coffee! It looks more like dessert! Okay, keep watching for past perfect! Pete: Yeah, that’s not why we’re late. This is why we’re late: I had arrived on time at 8:00 a.m. but didn’t see Anna. She was standing behind a tree. I think she was hugging it. I always walk to work. But she said that would take too long and that a scooter would be much faster. It was awful. I hated it. And it added too much time to our commute! Then Anna stopped by a pond to feed the birds. She had named them after characters from books and yelled the names out loud … Romeo! Juliet! Sherlock! By the time she had fed all the birds, we were late. Kelly: This is what I think. You two see the same event very differently. Does this happen often with you two? Kelly: Okay. This is good. This is good! It’s good to see things differently. I have an idea: we will call the show "He Said, She Said." For every story, you tell a different point of view. Anna: That is a great idea, Kelly! Pete, we are different. That’s why I thought of you for this job! Kelly: I think you two understand perfectly. Anna: Let’s get to work! Kelly: She named the birds? Really? * Business people in the U.S. think you should come to a meeting at the exact time. If you are late to a business appointment, you should call and explain why.